An epoxide is a cyclic ether with a three-atom ring. This ring approximates an equilateral triangle, which makes it strained, and hence highly reactive, more so than other ethers. They are produced on a large scale for many applications. In general, low molecular weight epoxides are colourless and nonpolar, and often volatile. A compound containing the epoxide functional group can be called an epoxy, epoxide, oxirane, and ethoxyline. Simple epoxides are often referred to as oxides. Thus, the epoxide of ethylene (C2H4) is ethylene oxide (C2H4O). Many compounds have trivial names, ethylene oxide is called "oxirane." Some names emphasize the presence of the epoxide functional group, as in the compound 1,2-epoxycycloheptane, which can also be called 1,2-heptene oxide. A polymer formed from epoxide precursors is called an epoxy, but such materials do not contain epoxide groups (or contain only a few residual epoxy groups that remain unreacted in the formation of the resin). The dominant epoxides industrially are ethylene oxide and propylene oxide, which are produced respectively on the scales of approximately 15 and 3 million tonnes/year. The direct reaction of oxygen with alkenes is useful only for this epoxide. It requires a silver catalyst. Other alkenes fail to react usefully, even propylene. Many epoxides are generated by treating alkenes with peroxide-containing reagents, which donate a single oxygen atom. Outside of the laboratory scale, the main challenge with this approach is that typical peroxides are more valuable than the product epoxides. For this reason, this methodology is restricted to fine chemical applications. Metal complexes are useful catalysts for these reactions. Typical peroxide reagents include hydrogen peroxide, peroxycarboxylic acids, and alkyl hydroperoxides (generated in-situ or preformed). In specialized applications, other peroxide-containing reagents are employed, such as dimethyldioxirane. Depending on the mechanism of the reaction and the geometry of the alkene starting material, cis and/or trans epoxide diastereomers may be formed. In addition, if there are other stereocenters present in the starting material, they can influence the stereochemistry of the epoxidation relative to them. The metal-catalyzed epoxidation was first explored using tert-butyl hydroperoxide (TBHP) as a source of an O atom. Association of TBHP with the metal generates the active metal catalyst with a peroxy ligand (MOOR), which then transfers an O center to the alkene. Simplified mechanism for metal-catalyzed epoxidation of alkenes with peroxide (ROOH) reagents. This approach is used for the production of propylene oxide from propylene using various catalysts. Both t-butyl hydroperoxide or ethylbenzene hydroperoxide can be used as oxygen sources. The process suffers from safety considerations owing to the risks of combustion from the combination of peroxides and alkene substrate, a consideration that weighs on almost all oxidative routes to epoxides. The reaction proceeds via what is commonly known as the "Butterfly Mechanism." The peroxide is viewed as an electrophile, and the alkene a nucleophile. The reaction is considered to be concerted (the numbers in the mechanism below are for simplification).The butterfly mechanism allows ideal positioning of the O-O sigma star orbital for C-C Pi electrons to attack. Hydroperoxides are also employed in catalytic enantioselective epoxidations, such as the Sharpless epoxidation and the Jacobsen epoxidation. Together with the Shi epoxidation, these reactions are useful for the enantioselective synthesis of chiral epoxides. Oxaziridine reagents may also be used to generate epoxides from alkenes. Chiral epoxides can often be derived enantioselectively from prochiral alkenes. Many metal complexes give active catalysts, but the most important involve titanium, vanadium, and molybdenum. The Sharpless epoxidation reaction is one of the premier enantioselective chemical reactions. It used to prepare 2,3-epoxyalcohols from primary and secondary allylic alcohols. Epichlorohydrin, is prepared by the chlorohydrin method. It is a precursor in the production of epoxy resins. This method involves dehydrohalogenation. It is a variant of the Williamson ether synthesis. In this case, an alkoxide ion intramolecularly displaces chloride. The precursor compounds are called halohydrins. Starting with propylene chlorohydrin, most of the world's supply of propylene oxide arises via this route. 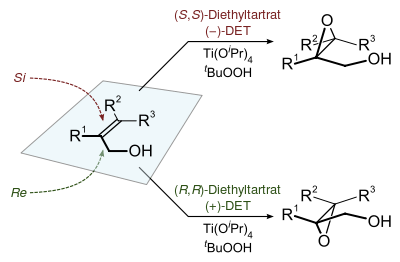 An intramolecular epoxide formation reaction is one of the key steps in the Darzens reaction. In the Johnson–Corey–Chaykovsky reaction epoxides are generated from carbonyl groups and sulfonium ylides. In this reaction, a sulfonium is the leaving group instead of chloride. Electron-deficient olefins, such as enones and acryl derivatives can be epoxidized using nucleophilic oxygen compounds such as peroxides. The reaction is a two-step mechanism. First the oxygen performs a nucleophilic conjugate addition to give a stabilized carbanion. This carbanion then attacks the same oxygen atom, displacing a leaving group from it, to close the epoxide ring. Ring-opening reactions dominate the reactivity of epoxides—they are potent electrophiles. Alcohols, water, amines, thiols and many other reagents can serve as the nucleophile for this reaction. This reaction is the basis of the formation of epoxy glues and the production of glycols. Under acidic conditions, the position the nucleophile attacks is affected both by steric effects (as normally seen for SN2 reactions) and by the stability of carbocation (as normally seen for SN1 reactions). Hydrolysis of an epoxide in presence of an acid catalyst generates a glycol. The hydrolysis entails nucleophilic addition of water to the epoxide.Under basic conditions, the nucleophile attacks the least substituted carbon, in accordance with standard pattern for SN2 processes. When treated with thiourea, epoxides convert to the sulfide, which are called thiiranes. Polymerization of an epoxide gives a polyether, for example ethylene oxide polymerizes to give polyethylene glycol, also known as polyethylene oxide. Epoxides also undergo ring expansion reactions, illustrated by the insertion of carbon dioxide to give cyclic carbonates. Reduction of an epoxide with lithium aluminium hydride the alcohol. 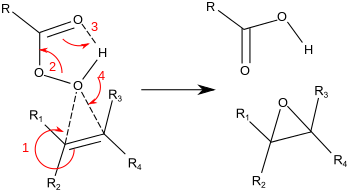 This reduction process results from the nucleophilic addition of hydride (H−). Reductive cleavage of epoxides gives β-lithioalkoxides. Bisphenol A diglycidyl ether is one of the components in common household "epoxy". The chemical structure of the epoxide glycidol, a common chemical intermediate. Epoxidized linolein, a major component of epoxidized soybean oil (ESBO), a commercially important plasticizer. Ethylene oxide is widely used to generate detergents and surfactants by ethoxylation. Its hydrolysis affords ethylene glycol. The reaction of epoxides with amines is the basis for the formation of epoxy glues and structural materials. A typical amine-hardener is triethylenetetramine (TETA). Epoxides are potent electrophilic alkylating agents, making many of them highly toxic. ↑ Siegfried Rebsdat, Dieter Mayer "Ethylene Oxide" in Ullmann's Encyclopedia of Industrial Chemistry, Wiley-VCH, Weinheim, 2005.doi:10.1002/14356007.a10_117 Article Online Posting Date: March 15, 2001. ↑ Indictor, N.; Brill, W. F. J. Org. Chem., 1965, 30 (6), 2074. (doi: 10.1021/jo01017a520). ↑ March, Jerry. 1985. Advanced Organic Chemistry, Reactions, Mechanisms and Structure. 3rd ed. John Wiley & Sons. ISBN 0-471-85472-7. ↑ Nikolaus Prileschajew (1909). "Oxydation ungesättigter Verbindungen mittels organischer Superoxyde". Berichte der deutschen chemischen Gesellschaft. 42 (4): 4811–4815. doi:10.1002/cber.190904204100. ↑ Paul D. Bartlett (1950). "Recent work on the mechanisms of peroxide reactions". Record of Chemical Progress. 11: 47–51. ↑ John O. Edwards (1962). Peroxide Reaction Mechanisms. Interscience, New York. pp. 67–106. ↑ Sheldon, R. A. Journal of Molecular Catalysis, 1980, 1, 107-206. (doi: 10.1016/0304-5102(80)85010-3). 1 2 Pham, Ha Q.; Marks, Maurice J. "Epoxy Resins". Ullmann's Encyclopedia of Industrial Chemistry. doi:10.1002/14356007.a09_547.pub2. ↑ Boron WF (2003). Medical Physiology: A Cellular And Molecular Approach. Elsevier/Saunders. p. 108. ISBN 1-4160-2328-3. ↑ B. Mudryk; T. Cohen (1995). "1,3-Diols From Lithium Β-lithioalkoxides Generated By The Reductive Lithiation Of Epoxides: 2,5-dimethyl-2,4-hexanediol". Org. Synth. 72: 173. doi:10.15227/orgsyn.072.0173. ↑ Niederer, Christian; Behra, Renata; Harder, Angela; Schwarzenbach, René P.; Escher, Beate I. (2004). "Mechanistic approaches for evaluating the toxicity of reactive organochlorines and epoxides in green algae". Environmental Toxicology and Chemistry. 23 (3): 697–704. doi:10.1897/03-83.